On Sunday, Kelley and I had friends over for dinner to celebrate them moving in together. To mark the occasion we served wines that meant something to us as a couple. We started with Champagne and nibblies: dates stuffed with walnuts, wrapped in prosciutto and baked. Then we had butternut squash soup (with a swirl of heavy cream and chopped fresh parsley) and Barbaresco, a 1999 Fontanabianca. The first Barbaresco I ever tasted was a 1995 Fontanabianca, in 1997 at an Italian restaurant (long since closed) in Seattle’s University District. One of those summer nights when I fell in love with Kelley all over again and began my love affair with the Piedmontese. The owner of the restaurant (a rogue called Angelo–who sometimes appeared at table with a black eye or missing tooth) suggested a wine (because at the time we knew nothing of Italian wine), and decanted it into a cheerful ceramic jug to air it out. I wasn’t watching: I was holding Kelley’s hand and grinning foolishly. But then, oh, the smell! It cut through my hormonal daze and made me pay attention: sun on mineraly dirt, and rising, rising like the last moisture from parched mineralyt earth. One day I’m going to go to Italy and I swear I’ll be able to find that vineyard by scent alone: it will be a steep hillside with dusty soil and a sky like a blue bowl. I will want to plunge my hand into the dirt to the wrist and sniff it. We’ve had all that late 90s vintages of Fontanabianca now, and they’re all wonderful. They all bring back the memory of that night. It was a long, lazy evening of wandering conversation. And we all went to bed smiling. It was. Here's the strange thing: the finer the wine, the less I drink. It was a five-hour dinner. We shared three bottles and some Armagnac between four of us. I love that. That does sound like a wonderful evening. 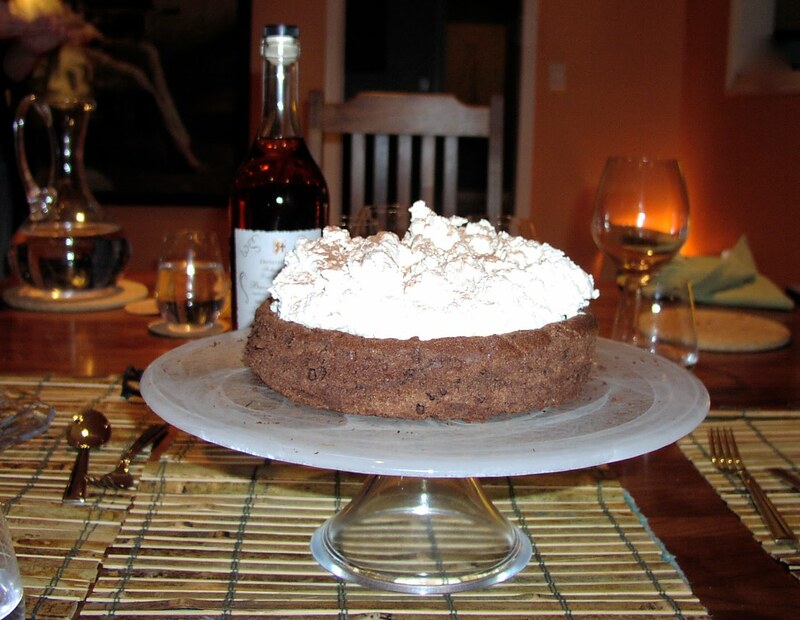 I enjoyed hearing the story of the wine and finally seeing a photo of the famous chocolate cloud cake. But what is 'spring' lamb stew? Do you have a different one in the winter? Good gracious. I'm in danger of falling in love with all of you, the food, the wine, AND the table. Ay yay yay! Know what I like about you? (Besides your gift for writing?) How you savor the experiences you enjoy, and recount them in such exquisite detail! I don't know a damn thing about wine except that I like it, but you make me want to learn.